In Cambodia's untouched Koh Rong Archipelago Song Saa spans the islands of Koh Ouen and Koh Bong and is connected by a footbridge over a marine reserve. Luxurious, intimate and harmonious, the beautiful pool villas, each with high-end creature comforts, promise a sanctuary where you can shower looking out over the sea or sip cocktails at sunset. Consider an upgrade to premium all inclusive (which we recommend), and everything that passes your lips from sunrise to sunset is included, be it breakfast in your villa, a romantic picnic on the beach, or dinner at the overwater restaurant. In one bedroom jungle villas perched amongst the rainforest canopy with air-conditioning, bath, indoor and outdoor rain showers, living area, safe and private pool. One bedroom ocean view villas, two bedroom jungle villas, two bedroom over water villas. 45 minutes by boat from Sihanoukville port. Boat transfers only operate during daylight hours. 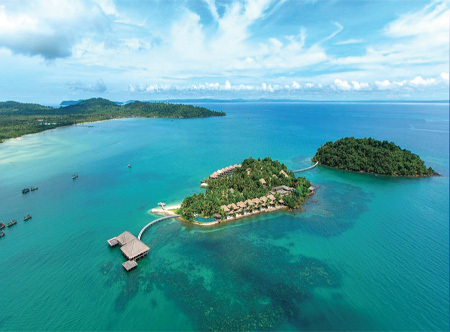 Song Saa Private Island is very open to the environment with private pools, steep hills and overwater walkways without hand railings, and is therefore only suitable for children under strict parental supervision. 08 Jan-31 Mar 18 if you book at least 30 days before arrival. 01 Apr-31 Oct 18 if you book at least 21 days before arrival. 08 Jan-31 Oct 18 if you are a repeat guest and stay at least 4 nights. 08 Jan-31 Oct 18 receive one bottle of sparkling wine, flower bed set up on arrival and flower bath set up on last night of stay. 08 Jan-31 Oct 18 book 5 villas and pay for 4. Must be over same dates and length of stay. Free villa is applied to lowest level villa.